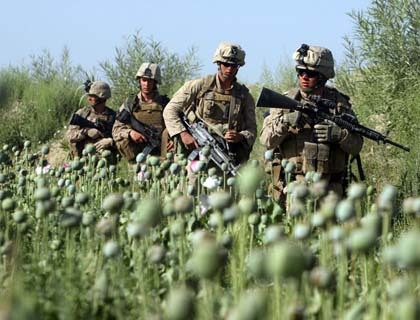 JNN 05 April 2014 Kabul : Since the US came down on the Taliban and occupied Afghanistan in 2001, heroin production in the country has surged almost 40-fold. One year ago the estimated number of heroin addicts dying due to Afghan heroin in the preceding decade surpassed well over one million deaths worldwide. n 2014 things deteriorated with the escalation of the political crisis in Ukraine and the Russia-US row over Crimea separating from Ukraine to reunite with Russia. Although NATO Secretary General Anders Fogh Rasmussen announced that the alliance will continue cooperating with Russia in countering drugs in Afghanistan, the real future for such cooperation looks grim, particularly after the US President’s deputy drug czar, Michael Botticelli,refused an invitation by his Russian colleague to come to Moscow, citing Russia’s actions in Crimea as the major reason. This entry was posted in Asia Pacific and tagged afghanistan, isaf, Kabul, Opium and Heroin, Production, US Forces. Bookmark the permalink.